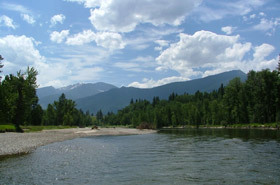 The Bitterroot River, like Rock Creek, flows north into the mother Clark Fork River, with its confluence just west of Missoula, Montana. Bitterroot river fly fishing trips are characterized by spectacular scenery and fantastic trout water. The Bitterroot valley is surrounded by the Sapphire Mountains to the east and the Bitterroot Mountains to the west. The river cuts and meanders though cottonwood bottoms with ever changing side channels; then it opens up onto breathtaking views of the granite peaks of the Bitterroot Range. Including the west fork Bitterroot, there are 100 miles of dry fly heaven. The Bitterroot River offers consistent hatches throughout the fishing season providing for some great dry fly fishing opportunities. There are a variety of prolific mayfly, stonefly and caddis hatches that occur on this fine trout stream. This is one of the rivers known for the Skwala stonefly hatch in the early season. Although difficult to hit because of inconsistent weather and water during the early season, if you hit it right you can experience some fantastic dry fly fishing. Later in the year the grassy banks and undercuts scream for a hopper/dropper on summer afternoons. Knowledgeable Bitterroot River fly fishing guides know the hatches and can dial you into what is going on when you are here. The Bitterroot River offers a wide range of great structure and trout habitat for fly fishing. Floating the Bitterroot River with an experienced guide and oarsman is the way to go-fishing the slick runs and seams, then hitting the diamond chop riffles and drop offs on the inside bends. With the numerous side channels, slews and springs, there are more opportunities to stop and wade fish than there is time to do it. Expect native westslope cutthroats, brown trout, and rainbow trout in the 10”-20” range on primarily dry flies or dry/dropper set ups.